Ok friends, if you want to have some fun on facebook, put "Sleigh bells ring are you listening?" as your status and wait for your friends and family to finish the song. It was so much fun. More fun was reading what they thought the words were (perspire for conspire…). Today I bring you the last quilt I made for this Christmas, "Let It Snow". This quilt was made for my wonderful Mother-in-love. I'm going to be making a runner for her as well with the scraps. I love how Mary, my quilter/friend put the circles on it. Each snowflake is outlined as well. Making a quilt with batiks was totally out of my comfort zone, a far cry from the pastels that call my name on a regular basis. This was fun, even though the scraps certainly look out of place in my scrap basket. Just look at you go girl...you are amazing! Wow, that is beautiful Renee! It is very unusual - I hope your MIL loves it! Gorgeous! I now what you mean about working with batiks. But you did a great job. 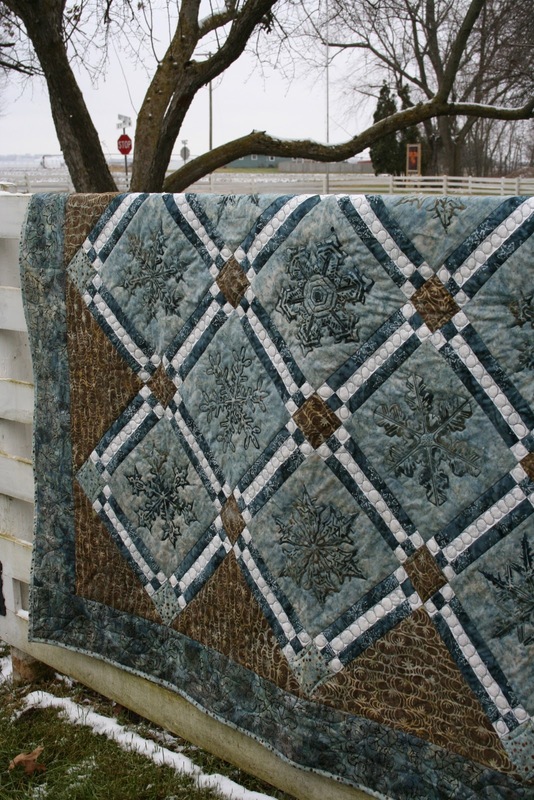 This is a gorgeous quilt but even more so because you refer to the receiver as your mother-in-love. How precious. She's the lucky one! Renee...my friend, you are AMAZING! So beautiful, Renee. I've been waiting to see how this one turned out. The nice thing is it can be used way beyond Christmas. You did a beautiful job with the batiks. This quilt is so beautiful!!! 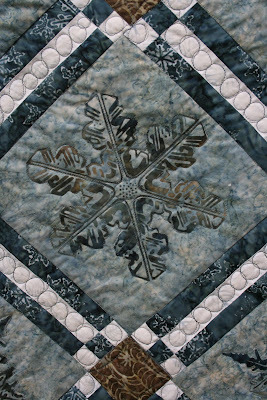 I love the colors and the snowflakes are so detailed. It looks fabulous!! OH, WOW!!! This one is my favorite! Your Mother-in-love is one lucky lady to receive this as a gift! Wishing you and your family a joyous Christmas!! God bless you an yours on this very special day!